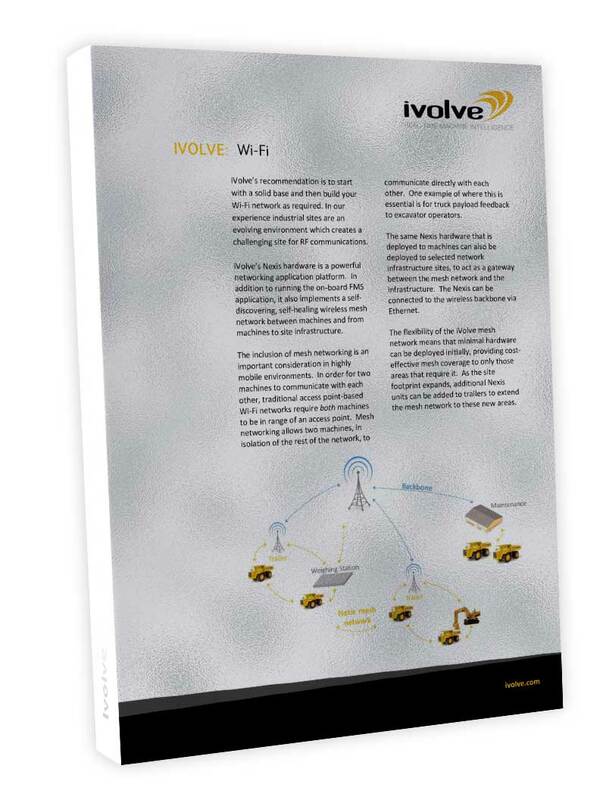 iVolve’s recommendation is to start with a solid base and then build your Wi-Fi network as required. In our experience industrial sites are an evolving environment which creates a challenging site for RF communications. iVolve’s Nexis hardware is a powerful networking application platform. In addition to running the on-board FMS application, it also implements a self discovering, self-healing wireless mesh network between machines and from machines to site infrastructure. The inclusion of mesh networking is an important consideration in highly mobile environments. In order for two machines to communicate with each other, traditional access point-based Wi-Fi networks require both machines to be in range of an access point. Mesh networking allows two machines, in isolation of the rest of the network, to communicate directly with each other. One example of where this is essential is for truck payload feedback to excavator operators. The same Nexis hardware that is deployed to machines can also be deployed to selected network infrastructure sites, to act as a gateway between the mesh network and the infrastructure. The Nexis can be connected to the wireless backbone via Ethernet.